How do I manage Groups in Commons? Group managers can change the group's name, add or remove group members, make other members group managers, and edit or delete resources shared to the group. A Group Manager is a role that must be assigned by an Admin. 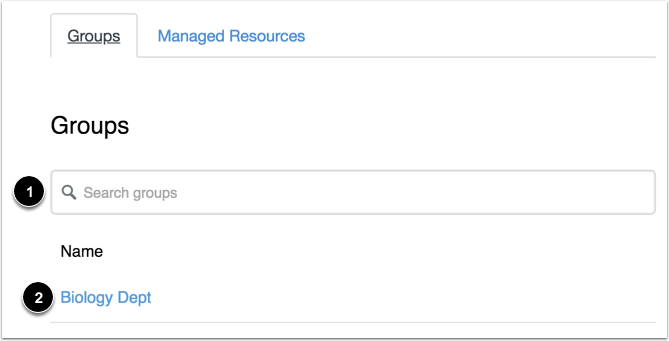 Learn more about how to add a Group Manager as an Admin. Find a specific group by typing in the Search groups field . To manage the group, click the group name . In the Edit Group page, you can change the group name  and add users to the group . To return to the Groups page, click the Back to All Groups link . Click the Search users to add field . Type the name or email address of the user and select the user from the search list . Users appear in the Group Member list . Commons displays the user's name  and email . To change the manager status of a user, click the toggle button . To remove a user from the group, click the Delete icon . Note: Only administrators can delete groups. Previous Topic:How do I edit the details of a resource in Commons? Next Topic:How do I view account settings in Commons? Table of Contents > All Users > How do I manage Groups in Commons?